In January, there was a lot of talk about colorism amongst Black and brown people. The topic was re-booted with the recent airing of Light Girls on Oprah Winfrey‘s OWN, a sequel to the melancholy documentary Dark Girls. The latter featured everyday darker-skinned women who talked honestly about being discriminated and feeling less beautiful because of their skin tone, while Light Girls was a kind of a rebuttal of “just because I’m light doesn’t mean life was always easy for me.” I definitely identified more with Dark than Light, I’m also a brown-skin girl, a bit in-between, medium tone. I’m neither extreme. I’ve never felt less beautiful because of it, but at times, I have felt left out of the conversation of color complexities. Then again, and most importantly, I wish such a discussion in our society wouldn’t (still) be of interest in the first place. One thing to know about me is that I’m a 90s child, so I felt I had a lot of positive and glamorous images of women of color and Black beauty growing up. Without anyone telling me, I knew that Black was beautiful and beautiful in all the shades it could possibly encompass. When I watched TV (the most powerful influence during such an impressionable time), aside from my mother, the recognizable faces of Naomi Campbell, Angela Bassett, Lauryn Hill, TLC, Tracy Chapman, Salt-N-Pepa, Janet Jackson, don’t even get me started on shows like Living Single, and Brandy (a definite icon thanks to her braids), showed me that beauty within the Black race couldn’t and shouldn’t be pigeon-holed as just a certain look or one type. Black beauty was distinct but also diverse. There was also the magazines Ebony and Essence, where I was reassured my voice mattered and then, I was looking forward to getting older and hearing about all the topics I cared about so much through their writers. Furthermore, I would be remiss to not mention JET, the iconic digest-sized magazine, with its current news headlines and special Beauty of the Week feature. Remember their Beauty of the Week? That honor began in 1952, months after the first issue premiered and was designed to celebrate the beauty of all Black women. Magazines like Harper’s Bazaar and VOGUE were only featuring White women and models. Black female movie stars like Dorothy Dandridge and Ruby Dee were on the rise, leaving left impressions on the big screen, and JET extended a Black woman’s right to see her name in lights by choosing a Beauty every week to be featured in its pages. For decades, being a JET Beauty of the Week was worth commemorating. It was like the beauty pageant of Black people, and the honor continued into the ’90s where I even heard it mentioned in the line in Friday from Ice Cube. He was referring to how cute Nia Long‘s character was (to paraphrase), “She was like a Jet Beauty of the Week.” Ha! I knew exactly what that meant. A girl who was obviously pretty, but also with a kind of regal presence about her. And thanks to the variety of women chosen by JET in the past, a crown that was worn before by all shades of brown. Speed up to 2014, the exhibit Speaking Of People was initiated at the Studio Museum in Harlem in New York. Of People showcased artwork JET and Ebony magazine had inspired was brought to life by contemporary artists. I honestly didn’t know what to expect when I visited, but I was excited by the idea of honoring such landmarks titles that meant a lot to generations of Black people, including me. 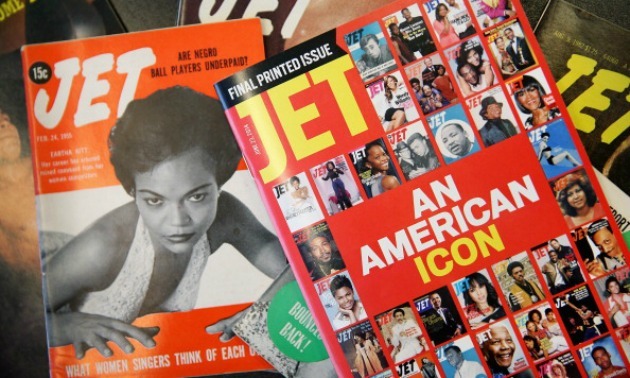 When other magazines (aka the White mainstream) treated our stories and trailblazers as mere trending topics, these publications had our back beyond the flash in the pan. But let me get to the amazing part! After browsing the artwork on the main floor, the tour guide led us downstairs where everyone in attendance was taking aback by the wall-to-wall collage of every JET Beauty of the Week from 1952 to 2014. The final print edition was published in early summer of 2014. Immediately upon viewing, I was overwhelmed by the display but also a sense of pride arose in me, like, “Look at all these beautiful Black women.” I thought of how they inspired so many to believe in their beauty because someone out there shared similar features, skin tone, and hair texture. I wanted to look at each and every one.